We here at the Society for the Control, Containment and Commodification of Women (CCCOW) were delighted to see your most recent press release proposing the replacement of cow's milk with human breast milk in commercial dairy products such as ice cream. We have long argued that women best serve society in their natural capacity as nurturers, and what better way to nurture America than as providers of dairy and other commercially viable foodstuffs? You state in your press release that human breast milk is nutritionally superior to cow's milk for humans, and we suspect that this may be true. This corresponds to the scientific findings of our Research Team, which has also found that human babies prefer human mothers, and also that human women are sexually attractive to many human males. This has led us to support the idea that human beings organize themselves into Family Units, wherein the woman remains within the home, caring for babies and servicing the males. Your proposal, however, that women provide breastmilk for use in commercial dairy products leads us to consider the possibility that the "family" might be reconfigured to better reflect the needs of a changing market society, and women put to better use. Specifically, why not establish Woman Farms, wherein women are kept and used for breeding purposes and for the purposes of supplying dairy for America's food supply? We have not yet worked out the logistics of such a program, but we imagine that it would be possible to remove human babies from their herded mothers and feed the babies with formula (which Science has proven to be comparable in nutritional value to breastmilk, and far more economically viable as a foodstuff for babies, if breastmilk is to be diverted into the marketplace), so that lactating mothers can be milked for the greater good of the American Economy, and cows released back into the wild (we propose that they be released in Alaska, where they will no doubt restore themselves to the ecosystem by becoming foodstuffs for polar bears and additional hunting quarry for Alaska's political elite, which will itself be a more balanced system once voided of women.) Dairy farmers of America need not suffer - a simple transfer program of cows for women (exact ratio to be determined, based upon productivity of lactating women as compared to cows and potential market value of human breastmilk over cows milk) and a government-funded transition program to educate farmers on the care and feeding of women, as well as some funding for equipment adaptation (we understand that breast pumps are less technically sophisticated than milking equipment, but very probably less durable), and so we believe that farmers will weather the transition easily. We believe that our proposal is more ethical and better suited to the wellbeing of both human and cowkind than the current, inefficient and immoral system of using cows as sources of dairy for human consumption: women are natural producers of milk for human consumption, and - if contemporary popular culture is to be believed, as we think it is - are happy in the state of pregnancy and lactation so long as they are kept supplied with Frappuccinos (blended with soy or formula, of course, the better to avoid Maternal Spongiform Encephalopathy, or Mad Mom Disease) and given regular pedicures and steady exposure to Entertainment Tonight and People Magazine. They will be happy to be contribute to the economy in this way, and will no doubt be glad to have played some small part in liberation of cowkind. *Ben & Jerry's is refusing to support our initiative, but we do currently enjoy the support of the Bovine Liberation Front and the NRA. Please consider lending your support! Where we stand on sleep chez HBM: there is none. The problem, at the moment, is this - I am single-parenting at the moment. The husband is working very long hours, such that he is only home for a few hours at night and can't spell me off. I gave Behemoth Baby some rice cereal last night, which seemed to help - he slept for about five hours, from 8pm to 1am, but I was so buzzed from lack of sleep and a day spent knocking back espressos that I couldn't settle during those hours. I fell asleep close to midnight, only to be awoken an hour later, and then every hour on the hour thereafter. I need to survive until end of day tomorrow, when the husband is back. How do I make it until then? Also, Gwyneth Paltrow can just zip it, please and thank you. Westjet has finally responded - in a comment to my original post (scroll waaaay down to here). Note that they get the incident wrong - they think that I've written about something that happened to another woman back in July. They assert that they've 'already apologized' for the incident. Which, no you did not, twits. I had no response to my original e-mail to them, and they clearly didn't read any of your letters, nor did they read either of the posts, because THEY THINK WE'RE WRITING ABOUT SOMETHING ELSE THAT HAPPENED TO SOMEONE ELSE. It actually made me freaking cry because, are you serious? Am too tired to shout at them to pay (expletive) attention. I just want an apology, even just some evidence that they pay a little (expletive) attention when a customer gets (expletive) upset. But am too (expletive) tired to deal with this right now. I hate everything right now. BAH. I have lost count of the numbers of days and nights it's been since I last had more than one hour of sleep at a stretch. Day and night have lost the crisp edges of their distinction: day blurs into night which blurs into day which blurs into night again and so on and so on and so on, without sleep. Day is brighter, night quieter, but it is otherwise difficult to tell them apart. Because at all hours of both day and night, there is this child, ravenous and growing, clinging to me, squirming against me or alongside me, always hungry, always growing, nursing longer than he sleeps. I am long past delerium. I'm caught somewhere between wakefulness and sleepiness, in some strange purgatory that holds me with my eyes open, my heart open, my mind closed and dark. I can see and feel but I cannot think; my head feels covered in thick gauze, a shroud. My heart remains open, awake. His gurgles and coos still make me smile. Even in a state of utter exhaustion, I feel love. I feel love. But I feel anxiety, too, when I try to leave the room, the better to attempt a longer, uninterrupted stretch of sleep. I feel anxiety when I hear him begin to stir and grumble and fuss. Anxiety for him, anxiety for me. I pad back into the bedroom and curl up next to him, pulling him to my breast and resigning myself to wear this heavy cloak of exhaustion, resigning myself to its pull and drag and yet still managing to smile, weakly, in the dark, when my boy sighs contentedly and grips my finger with his tiny fist. I love him so, I love caring for him so, but still. I am so, so tired. Sometime this morning, in the very early morning, when the light had yet to break over the horizon but its promise was there in the chattering of birds and the faint sounds of an occasional car pulling out into the quiet streets, the cloak engulfed me while I sat nursing. It covered me in its flat, heavy darkness and everything disappeared for a while, I don't know how long, until I startled awake to find the boy next to me, wrapped in his blankets, sleeping soundly, away from my breast and I shook, afraid, having no memory of having pulled him away from my breast, of having swaddled him and laid him down, of having drifted off. I was afraid, because the distinctions between day and night and light and dark and asleep and awake were no longer just blurry, but entirely obscured. When had I stopped nursing, when had he fallen back asleep, when had I laid him down? What if I had fallen, dropped him? Is it a miracle that I can mother in my sleep, or is it a terrible thing that I sleep while mothering? Endymion slept an eternity with his eyes open, ever-watchful, never losing sight of his beloved; I am not Endymion. It is daytime now, and the boy sleeps - for half of an hour, maybe, or three-quarters, if I'm lucky - and I fight sleep, knowing that I must be awake when he wakes, knowing that I can't bear the feeling of being dragged back from the point of unconsciousness just when it has begun to overtake me. Knowing that I can't bear the idea of not being dragged back from that point when he wakes. Knowing that I can't be, I mustn't be asleep on the job. So I sit here, awake, praying for sleep, praying against sleep, knowing that this cannot last. 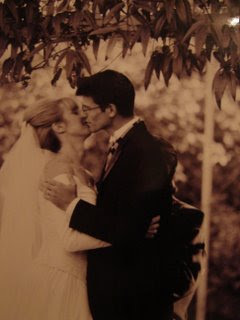 Twelve years ago, today, we married. Twelve years ago today, we were only two, but we held our future in our hearts and we knew that it was bigger, so much bigger, than we two. Twelve years later, we hold our future in our arms; we clutch our two to our chests and marvel at how we have grown, how our hearts have grown, how our life has grown, how it continues to grow. Our future is so much bigger, so much bigger than we can know.